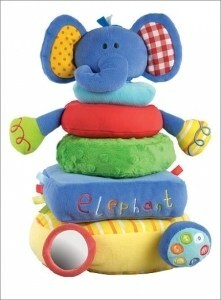 (1) This pachyderm stacker is made of delightful colors, textures, and shapes to make little builders giggle with glee. They will find lots of fun activities in this Elephant Stacking Toy ($29.95) which also includes a mirror, ribbon tags, and more. 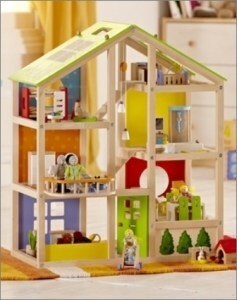 (2) With this multi-level, Educo Furnished All Season Dollhouse ($199.99), kids can do more than rearrange the furniture. They can also move the stairways and even flip the roof to match the seasons. This open-concept dollhouse makes it easy for multiple kids to engage in play. This sturdy dollhouse is made of plywood and maple from sustainable forests and will keep kids busy for years to come. (3) This real Singer® Deluxe Lockstitch Elite Sewing Machine ($79.95) is compact, portable, and has a variable-speed foot-pedal control just like Mom’s! 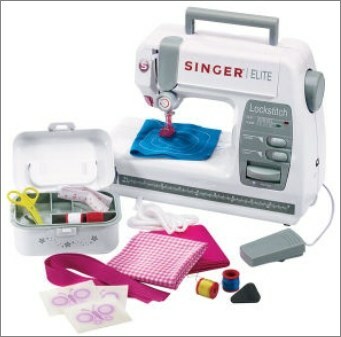 This innovative gift includes a project booklet and sewing box with colorful threads, scissors, and tape measure. 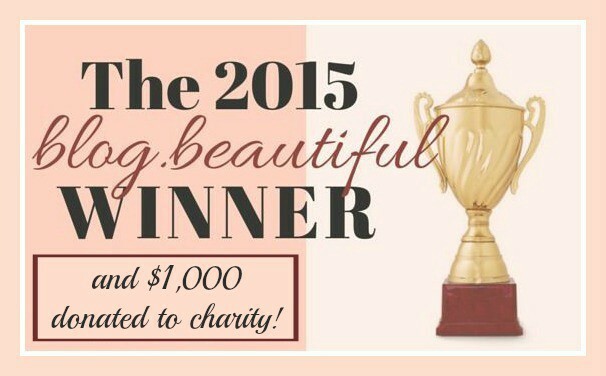 Those young designers will be ready for Project Runway in no time! 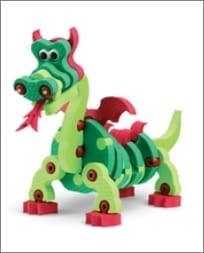 (4) This fiercely adorable 3-D Bloco Dragon is built with durable high-density foam and unique connectors. Kids will enjoy making dragons, snakes, and other cold-blooded creations from this Bloco Dragons & Reptiles Kit ($29.95). 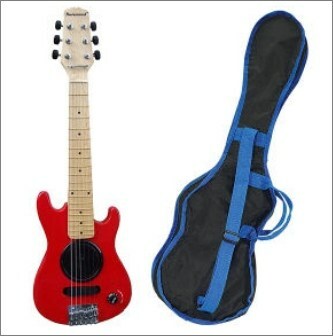 (5) This Real Electric Guitar with Built-In Amp (sold out) makes every rocker-in-training feel like a star. This quality guitar has a hand-crafted wood body with a 21-fret, maple fingerboard neck. The best part is the built-in amp; no plugs or wires. 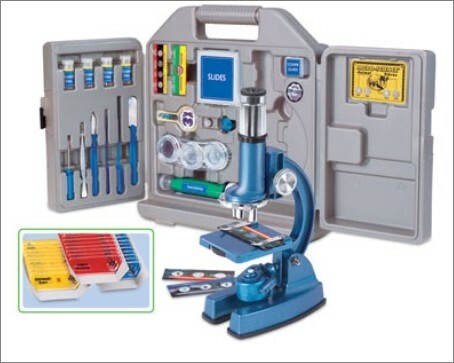 (6) This easy to use Young Scientist Microscope Set ($49.95) allows those budding scientists to view images 100, 600, and even 1200 times their normal size. The 9″ metal microscope comes with all the tools needed to observe and discover the wonderful world of science. (7) A chess game for beginner and experienced players alike. 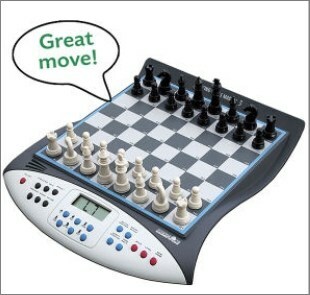 This Talking Electronic Chess Master ($49.95) helps beginners take their game to the next level by announcing illegal moves and warning against unwise choices. 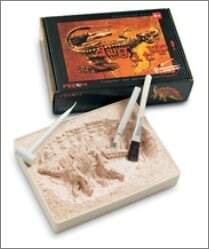 (8) Little paleontologists get to use a hammer, chisel, pick, brush, and sponge to carefully chip away and remove excess “earth” to gradually reveal a mini dinosaur skeleton model with this museum-quality Dig it Up Mini Excavation Kit ($12.95). 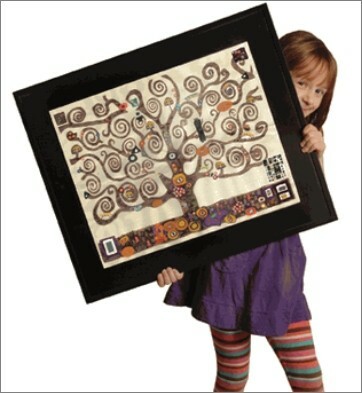 (9) This Gustav Klimt The Tree of Life Children’s Art Kit (sold out) from Kidzaw introduces kids to one of the great masters and allows them to bring out the artist inside. This art kit comes with everything kids need to be successful in creating their very own Tree of Life masterpiece. (10) This Digital MP3 Karaoke with Microphone (sold out) lets kids play and sing along to their favorite tunes. 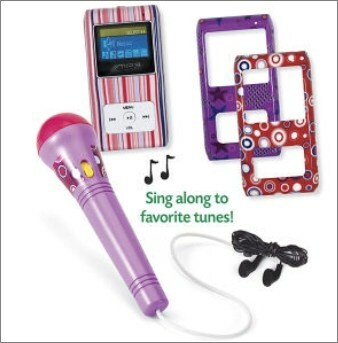 The 4 GB MP3 player holds up to 5,000 songs and features a color screen. This clever gift comes with changeable faceplates, earphones, and easy-to-use software for converting audio CDs and organizing music files and playlists. 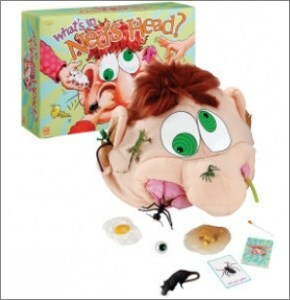 (11) Be prepared for squeals of grossed-out delight when children figure out What’s In Ned’s Head ($29.95)? Ned’s plush noggin is used to play this comical game where a card is drawn with a picture of a silly or icky item that is in Ned’s head. Players then reach into his head and feel around to find that object. 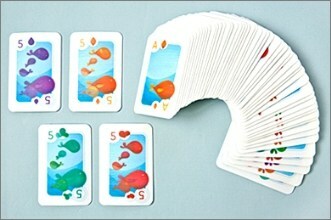 The first player to find the item keeps the card and wins that round. 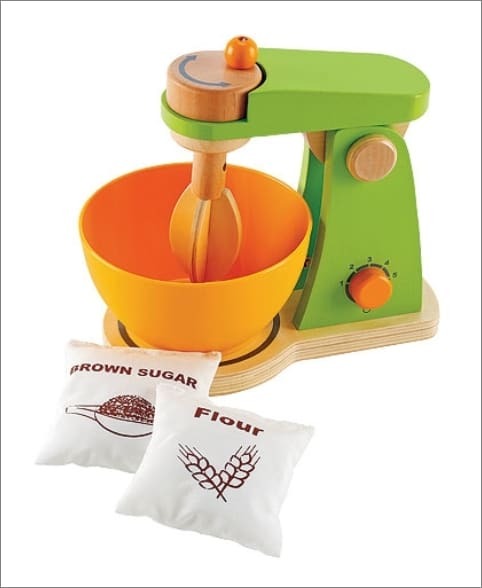 (12) Kids get to whip up some creative play with this charming Toy Wood Mixer ($18.83). Cooks are able to turn the handle to make the beater spin and lift the arm to remove the mixing bowl. This quality wood toy mixer will inspire hours of hands-on fun. (13) These waterproof Floating Playing Cards ($12.99) are great for use in the tub or at the lake. They will provide your family hours of good honest fun and come packaged in a zippered mesh bag where you can store them when not in use. 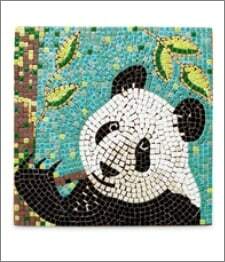 (14) Creative kids of all ages will enjoy making art with this beautiful Panda Mosaic Kit (sold out). 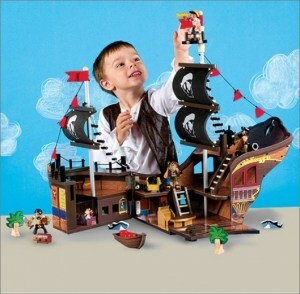 An adhesive template allows pieces to be easily placed. 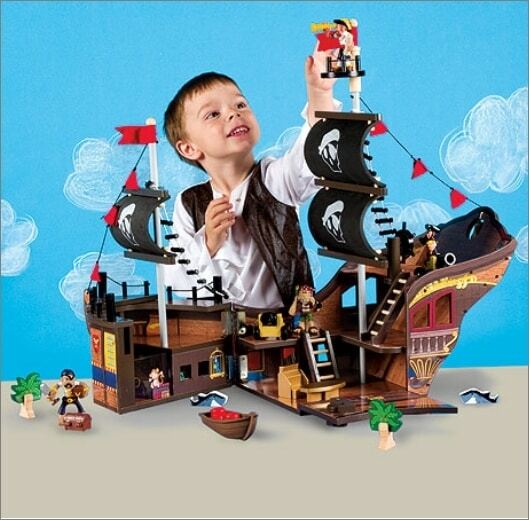 (15) This heirloom-quality Toy Wood Pirate Ship (sold out) is filled stem to stern with swashbuckling details: rope ladders, crow’s nest, lifeboat, pirates, sharks, and the must-have plank. This beautifully-crafted ship has three levels and opens up for access to a detailed interior. 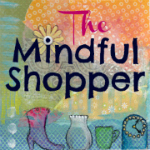 Thank you for stopping by The Mindful Shopper! 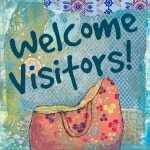 I hope you enjoyed my post “Gifts For Creative Kids”! Ned the Deadhead has got to be one of the more creative toys I’ve seen. Can’t wait to enjoy it with my nieces and nephews over Thanksgiving!!!! Also really like the dragon/reptile builder kit. I would have gone to town on those as a child. 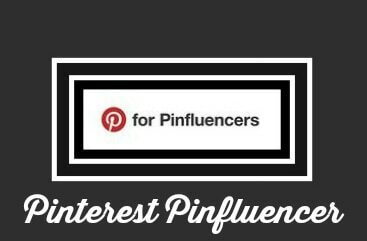 Thanks for sharing these creative toys on the #smallvictoriessunday linky. My favorite is the paleontologist set. My son would love it. Thank you so much for stopping by! 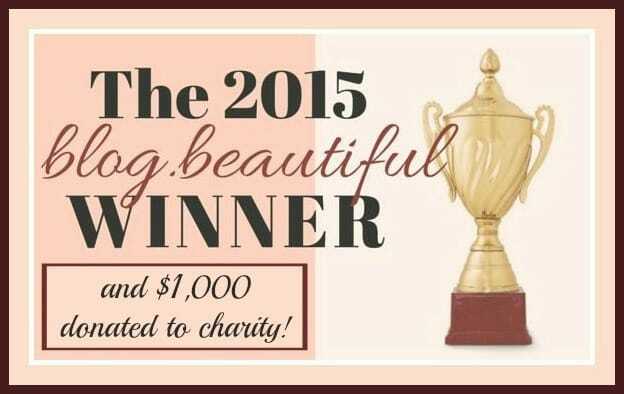 Much thanks!